Welcome to our Water Quality Interpretation Tool. This resource has been created to help you evaluate your drinking, livestock and irrigation water quality test results. The tool was developed by water experts at Colorado State University with input from colleagues at land-grant universities in the western U.S. To use this tool, simply follow the instructions provided below. Please visit our Contact Us page to reach the team member in your state who will be able to assist you with any questions you may have. Adobe Reader is required to view PDF files. To download free Adobe Reader software click here. Enter the values that have been provided to you by a laboratory in the spaces pertaining to your analyses results. If you do not have a value for a particular parameter, leave the space blank. Click the submit button below to obtain a table with an interpretation of the quality of your water. If you need to start over, or wish to enter data for a different type of water, click the reset button below. (Adjusted) SAR is a measure of the tendency of soils to accumulate sodium on the exchange complex, taking into account the extent to which waters will precipitate or dissolve CaCO3, thereby increasing or decreasing the sodium hazard. Water with a low sodium hazard will have an adjusted SAR of 0 to 10. Medium Hazard will range from 10 to 18. High Hazard will range from 18 to 26. 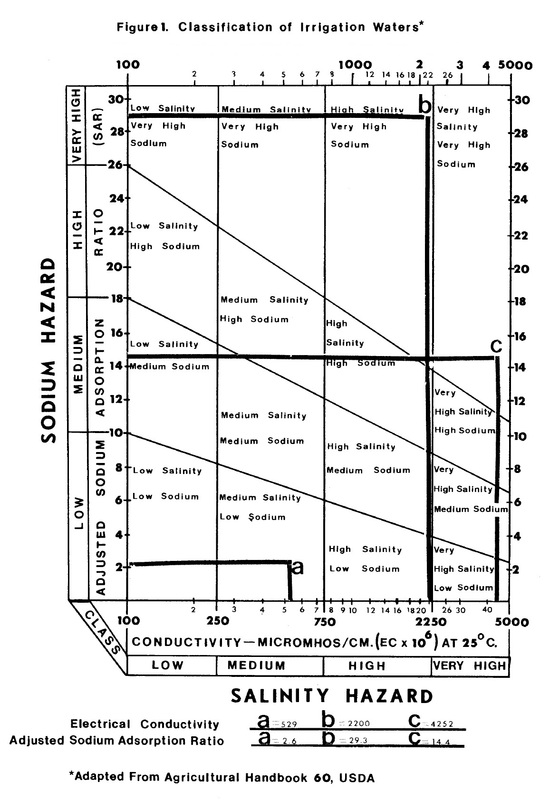 Very high sodium hazard begins with 26 and higher. These ranges are based on low salinity and will extend lower as salinity rises. Reported values for your water sample's nitrogen concentration can differ depending on the method the testing laboratory used to calculate your values. Concentrations for all situations are usually expressed in milligrams per liter (mg/L) or parts per million (ppm) of nitrogen. Most laboratories report nitrate values as (NO3-N) also known as 'nitrate as nitrogen'. This refers to the actual amount of the element nitrogen (N) in the nitrate ion (NO3). However, some labs may report 'total nitrate' as the actual nitrate ion (NO3). The relationship between these reporting methods is: 1 mg/L nitrate-nitrogen (NO3-N) = 4.43 mg/L nitrate (NO3). So for instance, a sample result of 25 ppm NO3-N is the same as 110.75 ppm NO3. Occasionally laboratories will report Nitrate and Nitrite together. In this case, concentrations are reported as (NO2 + NO3-N) or 'nitrite plus nitrate as nitrogen'. The following formula will help you convert easily between the (NO3-N) and (NO3) reporting methods. 10 mg/L nitrate-nitrogen (NO3-N) = 44.3 mg/L nitrate (NO3). Reported values for your water sample's nitrogen concentration can differ depending on the method the testing laboratory used to calculate your values. Concentrations for all situations are usually expressed in milligrams per liter (mg/L) or parts per million (ppm) of nitrogen. Most laboratories report nitrite values as (NO2-N) also known as 'nitrite as nitrogen'. This refers to the actual amount of the element nitrogen (N) in the nitrite ion (NO2). However, some labs may report 'total nitrite' as the actual nitrite ion (NO2). The relationship between these reporting methods is 1 mg/L nitrite-nitrogen (NO2-N) = 3.28 mg/L nitrite (NO2). So for instance, a sample result of 25 ppm NO2-N is the same as 82 ppm NO2. The following formula will help you convert easily between the (NO2-N) and (NO2) reporting methods. 1 mg/L nitrite-nitrogen (NO2-N) = 3.28 mg/L nitrite (NO2). Testing labs generally analyze for nitrate and nitrite together so the results are often expressed as the total of Nitrate + Nitrite (NO3-N + NO2-N). Residual sodium carbonate (RSC) index of irrigation / soil water is used to indicate the alkalinity hazard of soil. RSC index is used to find the suitability of water for irrigation in clay soils which has high cation exchange capacity. When dissolved sodium in comparison with dissolved calcium and magnesium is high in water, clay soil swells or undergoes dispersion which drastically reduces its infiltration capacity. This ratio quantifies the proportion of sodium (Na+) to calcium (Ca++) and magnesium (Mg++) ions in a water sample. In the soil, calcium will flocculate (hold together), while sodium disperses (pushes apart) soil particles leading to poor soil condition. Many factors including soil texture, organic matter, crop type, climate, irrigation system, and management impact how sodium in irrigation water affects soils. Sodium in irrigation water can cause toxicity problems for some crops, especially when the water is applied with a sprinkler system. SAR and ECw are interdependent and thus irrigation suitability is characterized by both values. The following is a breakdown of the general classifications of irrigation water based upon the SAR values. Course Sand to Fine Sandy Loam: maximum EC of 3000 micromhos per centimeter and maximum SAR of 12; Loam and Silt Loam: maximum EC of 3000 micromhos per centimeter and maximum SAR of 9; Very Fine Sandy Loam to Silty Clay Loam: maximum EC of 2250 micromhos per centimeter and maximum SAR of 9; Loam to Clay Loam: maximum EC of 1500 micromhos per centimeter and maximum SAR of 6.